The old North Neighborhood Library building is expected to be the site of the city’s winter shelter and in the future be developed into affordable housing. File photo by Stephanie Rivera. 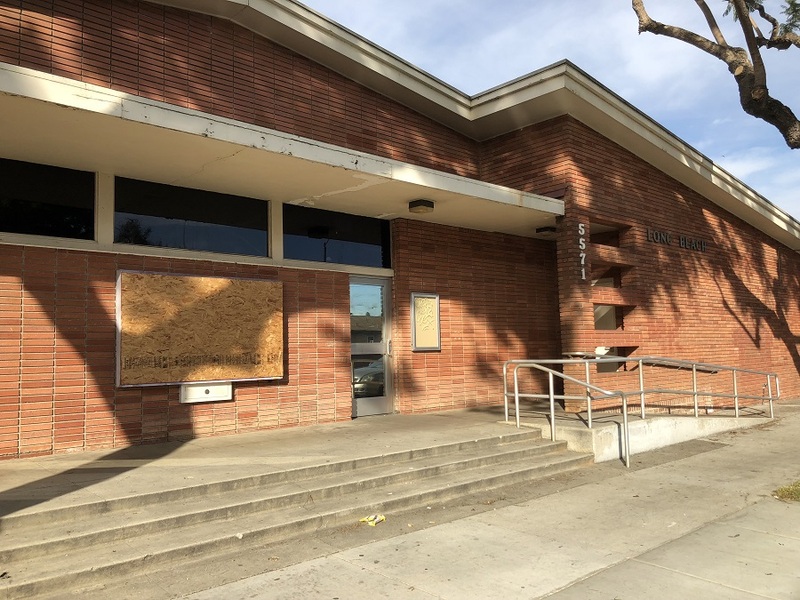 The City Council on Tuesday approved the sale of the 7,318-square-foot parcel at 5571 Orange Ave. for $729,000 to the Long Beach Community Investment Co.—the city’s separate nonprofit entity—which submitted a proposal to develop the property into residential units. Proceeds from the sale are expected to provide one-time revenue to the city’s general fund. The nonprofit’s plan includes selecting a buyer and developer to create “affordable rental or for-sale affordable residential units,” according to a staff report. City officials believe it could create about six units that are two stories in height. The project’s next phase won’t likely begin until next year when the developer is chosen and the design is selected. City Manager Pat West said a demolition of the site may happen within the next 12 months. Until the site is demolished, however, it will be serving multiple uses. As part of the agreement with LBCIC, the building will serve as a temporary site for the Health and Human Services Department’s Center for Families and Youth, which provides services like counseling, parenting classes and job training, while its current location at Houghton Park undergoes repair. Houghton Park is currently undergoing a renaissance, including a new community center slated to open next year. The property may also be used as an emergency homeless shelter this winter once again. The City Council is scheduled to hear an item on next Tuesday’s agenda that recommends re-declaring a shelter crisis in order to allow the operation of the winter shelter at that property. The winter shelter would be operated once again by U.S. Veterans Initiative, the provider selected by the Los Angeles Homeless Services Authority, which is funded by the city and county of Los Angeles. LAHSA coordinates its winter shelter program countywide from Dec. 1 to March 31. As part of the program, each provider is required to provide intake services, nightly shelter for individuals, vouchers, showers and two daily meals. The City Council will discuss the agenda item during its regular meeting at 5 p.m. on Tuesday, Nov. 20 at City Hall, located at 333 W. Ocean Blvd.